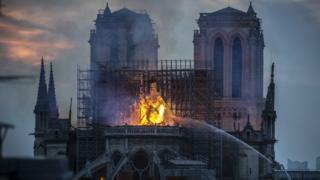 Di Cathedral of Notre-Dame, wey catch fire on Monday evening, na one of di popular building dem for Paris, about 13 million visitors dey visit di place every year. 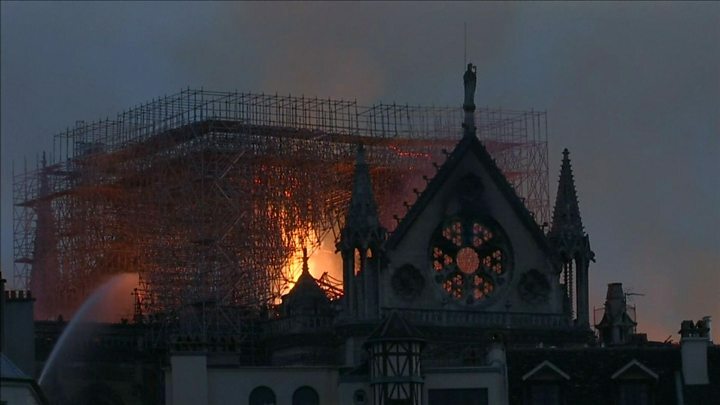 One of France richest businessman Francois-Henri Pinault, don promise to give hundred million euros make dem take rebuild Notre-Dame cathedral wey fire burn. Paris Law office say dem dey investigate how fire take burn some part of di 850 year old building. Di cathedral, wey name mean Our Lady, na di seat of archbishop of Paris and dis na history you suppose know about Notre-Dame Cathedral. Dem build di cathedral for one small island wey dem call Île de la Cité, for di middle of Seine. Na for 1163 dem begin di construction, during di reign of King Louis VII, and dem complete am for 1345. Na one of medieval Gothic architecture. Dem neglect di building for 1790s, during di French Revolution. Victor Hugo's 1831 novel, "Notre-Dame of Paris," wey dem publish for English as Di Hunchback of Notre Dame," na im let pipo know about di building condition. Di book help well-well as dem renovate di building from 1844 to 1864, na dat time di architect den Jean-Baptiste-Antoine Lassus and Eugène-Emmanuel Viollet-le-Duc redo di spire and flying buttresses. Historic event wey happen dia? For 1431 inside Notre-Dame dem make Henry VI of England king of France. Na for dia dem also crown Napoleon Bonaparte emperor, wey try to save di cathedral for 1804. For 1909, Pope Pius X beatify Joan of Arc, wey help France fight di English wey dem burn for stake centuries, for di cathedral. Wetin be dey happun when di fire break out? Dem still dey hold mass for di cathedral on Sundays, even though serious renovation still dey go on. Weather and time don affect di building. Di Cathedral don burn before? Yes. In fact di present building dem use am replace one church wey fire burn. Fire burn di building again for di 13th century, wey make dem to work on di cathedral between 1230 and 1240. Notre Dame cathedral take 182 years to build according to architecture expert Jeremy Melvin wey say e give us an idea into di way pipo bin dey tink, feet and work during during dat important period inside in European history.